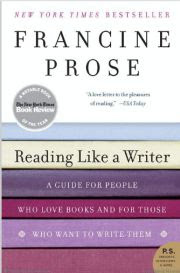 Tonight I began reading like a writer by picking up Reading Like A Writer – A Guide For People Who Love Books And For Those Who Want To Write Them, by Francine Prose (Harper Collins, 2006). Prose (great name for a writer, eh?) believes, as I do, that we learn to write well by reading good writing. She would know. She’s written more than 20 books and taught writing for over 20 years. In this well-crafted work, she shows us how to really read, word by word, sentence by sentence, digging into the mind and intention of the author. Our job is to understand the writing. She calls that “close reading,” a term I’d never heard, though it reminds me of the way I read in French and have to think about the words. I’m loving it. I read this way when I’m editing, but not when I’m reading. When I read fiction, I read it for the story. Long descriptions of the sunset, the garden, the room or anything that doesn’t have people doing something are punished with a speedy turn of the page. I need action and interaction. In this book, Prose asks me to read a piece of fiction just for the writing. For each writing topic – words, sentences, paragraphs – she illustrates her points with passages from authors whose work she admires, Chekhov, Joyce, Austen and others. She provides enough context for the passage to make sense, then shines a spotlight on the words each author has used to craft the images that will become a story. As a guide to writing etiquette, Prose recommends The Elements of Style, by Strunk & White (Macmillan, 1959). I agree. My own yellowed and crumbling copy has been used to tidy up my own writing, help me edit others’ work, settle newsroom arguments and start lively (lovely?) and entertaining conversations about misused words. Will Reading Like A Writer improve my writing? Can’t say yet. But it’s already improved my reading. I recommend it. And Strunk & White. Next post: Just stop it now!